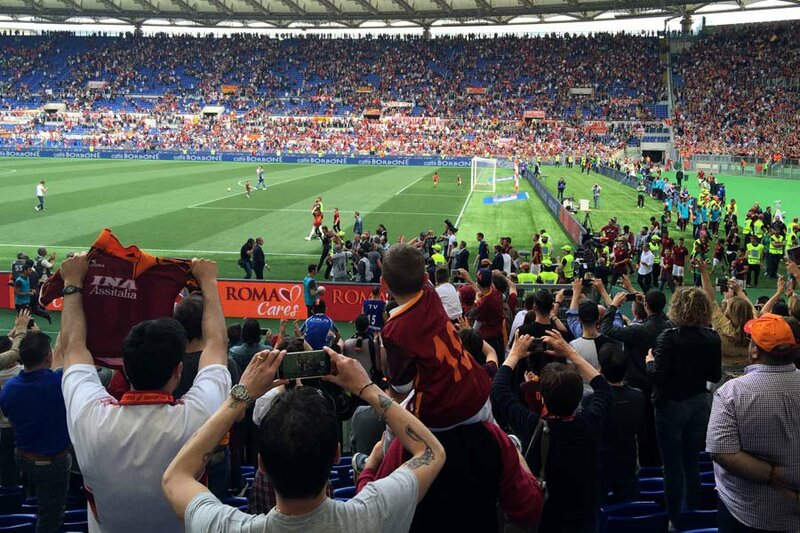 A sea of orange and red at the AS Roma stadium. All photos by Erica Firpo. The First Soccer Game is a rite of passage for every Italian parent and child. Erica Firpo schools her daughter in the sacred sport. In a soft voice, the conversation begins with color, a poignant preamble about the beauty of orange and red, with a casual mention of a slight disdain for boring baby blue. Heads nod in agreement as The Talk turns into A Dramatic Narrative — the rags-to-riches story of a young boy with a golden foot, and how that foot has traversed field after field and adversary after adversary to win the scudetti badges bestowed to series victors as well as hearts across the world. There is a reverent pause in homage to that young boy, who is now the captain of his hometown team, that incredible team known simply as — city champions, underdogs, fighters. I blame school and her older sister for creating this die-hard Romanista. In first grade, she started collecting figurini, the with adhesive players card stickers. 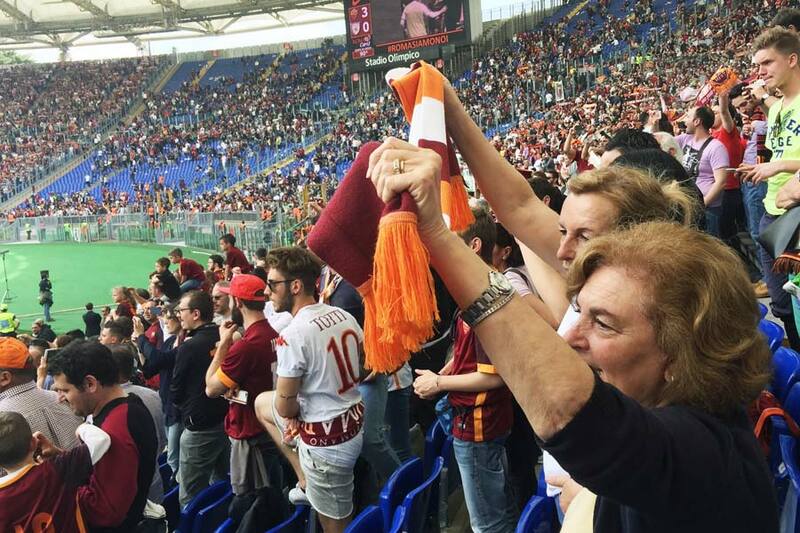 By second grade when she only wanted Roma players, the collectibles weren't enough. She wanted to see a real game. 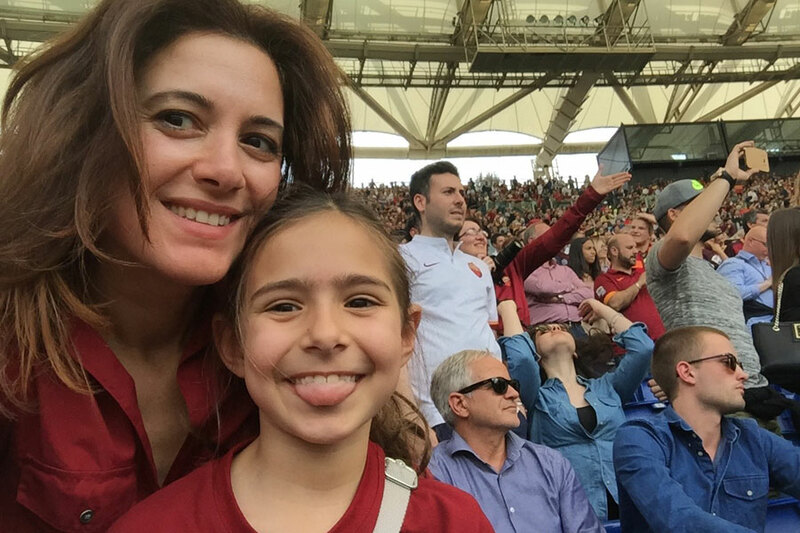 As any good mother would do, I sucked it up and got tickets to the Stadio for a Mother's Day game — the ultimate symbol of maternal sacrifice. With deliberate reason: In my opinion, every true fan should have at least one chance to see their favorite player on the home pitch. In her case, it was Mr. Golden Foot himself, , who, at almost 40 years old, was not guaranteed to return for the 2016-2017 season**. The experience was amazing. Roma dominated the game. Totti waved to us. De Rossi was as fine as he always is (the players are the best part of the game). My seven-year-old told me I was the best mamma in the history of all mothers. And I actually teared up while singing hard to Venditti's .